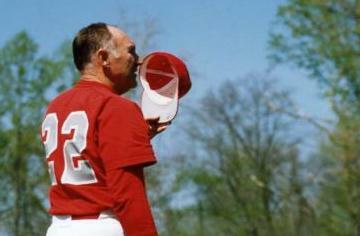 Longtime University of Lynchburg baseball coach Gerald R. Thomas ’61, ’83 Ed.S., died May 21 after a short illness. He was 81. Thomas taught in LC’s Health and P.E. Department in addition to serving for 27 years as the head baseball coach at LC. Thomas retired from the coaching ranks in 1995 with a 578-222-12 record. He was named the Old Dominion Athletic Conference Coach of the Year four times and was the Division III South Atlantic Coach of the Year in 1980. LC won 20 or more games in 20 of Thomas’ last 23 seasons and made nine trips to the NCAA Regionals. Thomas also played 10 years of professional baseball, eight in the Class AAA level with the St. Louis Cardinals, Los Angeles Dodgers, and New York Yankee organizations. He was inducted into the LC Sports Hall of Fame via a special citation in 1992, and his 1976 team was inducted into the Hall of Fame last fall. He taught Physical Education and coached baseball at Amherst County High School from 1947 to 1967. He was a member of Sandy Bottom Christian Church in Madison Heights and a U.S. Army veteran. Thomas and his wife Peggy have three children: sons Randy Thomas ’77 and Jay Thomas, and daughter Jan Campbell, a former employee in the LC Business Office. Granddaughter Jodie Campbell is a current student in the Class of 2013. Family visitation will be held from 6 to 9 p.m. on Wednesday, May 23 at Whitten Funeral Home, Monelison Chapel, located at 3966 South Amherst Highway, Madison Heights. A funeral service will at noon on Thursday, May 24, also at Whitten Funeral Home in Madison Heights. Memorial gifts may be made to Monelison Rescue Squad, Monelison Fire Department, or Sandy Bottom Christian Church.